Under our well-being initiative, we are dedicated to integrating eastern healing techniques with western medicine to treat the patient, their loved ones and caregivers. In 2007, we hosted a Well-Being Forum to stimulate an exchange of ideas between patients, doctors, nurses, yoga instructors and alternative healthcare practitioners. Out of that well-spring of inspiration, the UZIT Program was born. 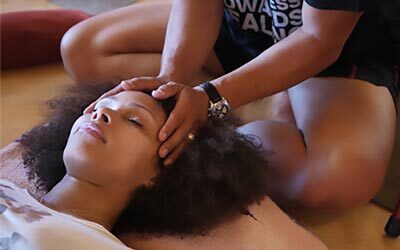 By creating the Urban Zen Integrative Therapy (UZIT) Program, we have trained members of the healthcare and yoga communities in the healing modalities of yoga therapy, Reiki, essential oil therapy, nutrition and contemplative care. This curriculum is uniquely designed to treat the classic symptoms of illness: PANIC™ (pain, anxiety, nausea, insomnia and constipation) and exhaustion. The objective of the Urban Zen Integrative Therapy program is to train integrative therapists to work in hospitals, outpatient care centers, support groups, private practices, corporate environments, nursing and medical schools to transform healthcare to include eastern healing techniques with western medicine. Each modality is introduced separately and then students are taught how to integrate the modalities to address those symptoms the patient or client is experiencing: PANIC™ (pain, anxiety, nausea, insomnia and constipation) and exhaustion. Once integration has been instructed, students begin their practical experience during the clinical rotation requirement, working with patients, loved ones and caregivers. Each student must complete a clinical rotation at an approved site in order to be certified.